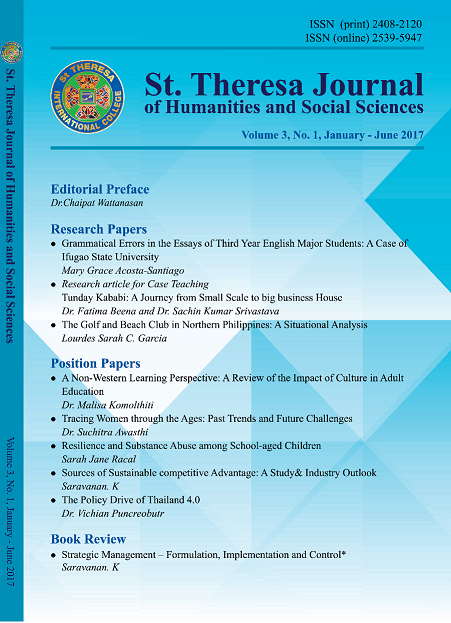 St.Theresa Journal of Humanities and Social Sciences publishes quality and original research that offers insights and practical implications pertaining to the fields of education and business management in order to serve stakeholders with practically useful knowledge. 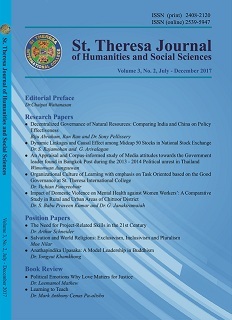 St.Theresa Journal of Humanities and Social Sciences is a bi-annual journal scheduled to be published on January-June and July-December. SJHS started publishing in both print and online versions from January 2015. The Volume 1 (Issue 1 & Issue 2) of 2015; and Volume 2 (Issue 1 & 2) of 2016 has been published successfully in both print and online versions. SJHS is inviting manuscripts for Volume 4, No.2, July-December, 2018 issue in the broad areas of Humanities and Social Sciences. Also, the old website will exists with its past issues. Thank you very much for extending your support. ISSN: 2539-5947 (Online). 2408-2120 (Print).